Redwoods Rural Health Center is the non-profit organization that the Gyppo Ale Mill will be raising money for with our Pints 4 Non-Profit event this Friday (8/31). Redwoods Rural offers everything from Dental, Behavior Health, Acupuncture and general Medical services. Did you know that one of our favorite Mug Club members, Mandi Battles, is their Stanford graduate Physician Assistant?! This event will be from 11AM to 5PM and the talented and beautiful Savannah Rose duo will also be performing from 3pm to 5pm. 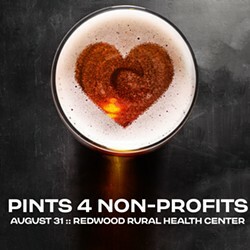 Come on in and drink for a good cause!